In this episode, we leave the museums far behind and venture to the home of a private collector Mr. Warwick Bolton to visit his pride and joy – The AMX-13.A French Light Tank that was exported to over twenty-five other nations and was in Service all the way up to 1985. So join us for this two part special looking at the oddity with the oscillating turret. The AMX-13 is a French light tank produced from 1953 to 1985. It served with the French Army, as the Char 13t-75 Modèle 51, and was exported to more than 25 other nations. Named after its initial weight of 13 tonnes, and featuring a tough and reliable chassis, it was fitted with an oscillating turret built by GIAT Industries (now Nexter) with revolver type magazines, which were also used on the Austrian SK-105 Kürassier. Including prototypes and export versions, there are over a hundred variants including self-propelled guns, anti-aircraft systems, APCs, and ATGM versions. Total production of the AMX-13 family is approximately 7,700 units, around 3,400 of which were exported. The tank was designed at the Atelier de Construction d’Issy-les-Moulineaux (AMX) in 1946 to meet a requirement for an air-portable vehicle to support paratroopers. The first prototype ran from 1948. The compact chassis had torsion bar suspensionwith five road-wheels and two return rollers; the engine runs the length of the tank on the right side, with the driver on the left. It features an uncommon two-part oscillating turret, where the gun is fixed to the turret and the entire upper turret changes elevation. The turret is set to the rear of the vehicle and holds the commander and gunner. The original 75 mm gun was loaded by an automatic loading system fed by two six-round magazines located in on either side of the automatic loader in the turret’s bustle. The 12 rounds available in the drum magazines meant that the crew could engage targets quickly; however, once those rounds were expended, the vehicle had to retreat to cover and the crew had to reload shells from outside the vehicle. Production began at ARE (Atelier de Construction Roanne) in 1952, with the first tanks delivered the following year. In 1964, production was transferred to Creusot-Loire at Chalon-sur-Saône, as ARE switched to the production of the AMX 30 MBT, and the numbers produced declined significantly. From 1966, the 75mm high-velocity gun was replaced by a 90 mm (the AMX-13/90) medium velocity gun firing more effective HEAT ammunition, with the French upgrading all existing base models to this specification. 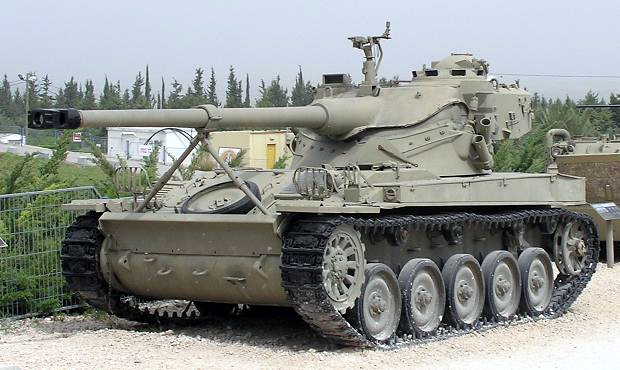 By the early 1970s, export models were available with an even more potent 105 mm gun. Although there were many variants on the turret, the basic chassis was almost unchanged until 1985, when changes including a new diesel engine, fully automatic transmission and new hydropneumatic suspension were introduced.